I’ve been in the city for a while now and I’m adjusting. I have found there are still green places here. The inhabitants are very interesting, if a little unusual at times. I am dedicating this post to one of my favourite bloggers, Fundamental Jelly. He always inspires me with his clever and witty way of seeing the world. 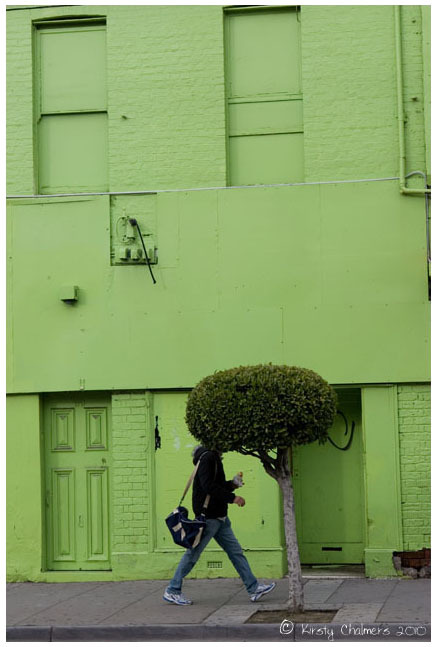 I have to say that you do much better with a “GREEN” composition than I, dear astiste! Love it!!!!! That’s “artiste” not astiste. Sorry! lol you do great things with green Leslie! Being in the city provides so many rich opportunities for your talent! Thanks Kate. Things have been a bit crazy of late but I’m hoping to get out with my camera more soon. A lot of green but only a little is ‘living’—but a little is better than NONE! Green tea too. Yep. Some green gunpowder tea or Ancient Emerald Lily might help. Yep. Eat the sun whenever possible aka fruits & veggies! Yum. lol – This photo is a little unfair in its portrayal of Prahran. This spot is actually just across the road from a wonderful fresh fruit and vegetable market, one of the best in Melbourne. I was there today buying lots of yummy healthy food. No green tea though. Just fresh ground coffee (my favourite) :). Well now that is interesting. You have any photos of the market to post? –Yep, here through link you ‘sen’t. Am I the only one having issues connecting? if so then it’s all MOI’s blog. Hmm…a mystery. LOL. Haha, that’s sweet Kirsty. I could say the same thing about you…in fact, I do say the same thing. Thank you my friend, and yes, I totally love the shot. Anyway, I love tree head. I have been stuck in some other strange place (called caring for sick Mother land) but I am now back.